As of late Monday night, predictions for a possible snow event Tuesday night into Wednesday was, as MPR’s Paul Huttner put it, “a forecast in flux.” Although the National Weather Service issued a Winter Storm Watch mid-afternoon Monday, there was a sense that many forecasters were not quite buying into such lofty possibilities. However, there was also a sense that the storm was taking a more southerly route, which would bring heavier accumulations closer to the Twin Cities from the north. Here’s our recap of forecasts gathered late Monday night for snow possibilities Tuesday night into Wednesday. 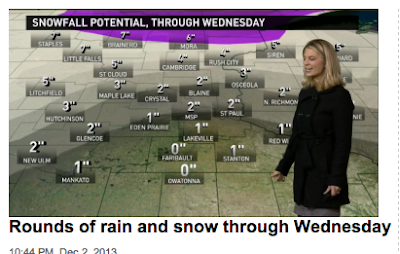 WCCO: 1-3” but more possible later on Wed.
Side note: We did want to bring attention to what we consider one of the better weather blogs for a Twin Cities television forecaster (i.e., excepting MPR and Strib weather columns). KMSP's Cody Matz provided some nice graphics and an accompanying explanation of how and why the expected heavier snow accumulations have moved south in this blog. Finally, a reminder that you can find us on Twitter and Facebook. Should be interesting. I did see in the NWS discussion that the watch was issued with low confidence and even if the total amount of snow doesn't get over 6", one of the cocerns is a flash freeze. Well the shift south has happened and the good ole GFS is on board....thus the winter storm warning has been hoisted......NWS calling for 6-9 for the entire metro, sharp gradient stays south.....alot of mets will be changing their tune all day today, it will fun to hear how they spin it. @DDwx welcome back and enjoy the white stuff! Sometimes it feels like the NWS is the shunned sister and they wield their appreciable powers (the ability to put out watches, warnings and advisories) to get attention when they feel they're not getting enough. I know that sounds rather silly, but as they seem less conservative than they used to and seemingly quicker to pull the trigger on watches, etc., it makes you wonder. Big flakes in Mankato right now and sticking. let the fun begin! Steady wet snow just starting to fall in Burnsville. Kare 11 (specifically Sven) is still calling for rain showers to develop late this morning and into the afternoon before mixing with snow late this evening. I'm near the Mall of America where it has been snowing steadily for an hour. The ground is turning white. Way to go, Sven. Keep predicting that rain. As a snow lover, I'm loving it!! The Duluth NWS is showing the L moving in a sharply northern direction which reminds me of the 91 Halloween path. Do you think there's a chance this storm could drop significantly more snow than anticipated or is it moving too quickly? Other factors in play? Here in Duluth some spots have already received 16 inches. 12-18 more in forecast. No question this storm has potential to rival the Halloween storm, at least here in Duluth. It snowed for a while here in St Paul. No accumulation. Our resident mets on here have been eerily quiet today. Has the storm been delayed or is this a bust?, reading forecasts this morning I expected precip. to be ongoing by now, looking at radar the closet return is out in northcentral Nebraska/SD. We're hoping to have a video with Dr. Novak a bit later this evening. Looked up my local point forecast- the NWS now has 5-10 inches total for where I live. Talk about upping in the ante! Before they were saying 4-6! Okay- maybe that means there is more uncertainty because of the wider spread... But still... Exiting. The point forecast at the airport has 4-8 inches, if anyone wants to know. Dave Dahl is now saying 10 inches in the northwest suburbs and 6 inches in southeast. PD is still saying 1-3 inches. Temps warm enough aloft for icy mix. 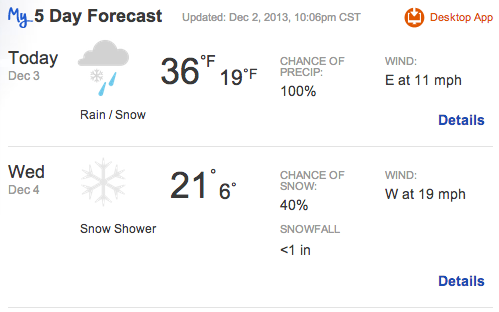 Interesting discrepancy in forecasts this late in the game. PD hasn't updated all day that I can see. His last update on Strib was at 8:42 am and his last tweet was yesterday. And here in the SW metro, it's already hovering around freezing after temps in the mid-30s with spotty snow showers most of the day. Unless temps rise, we're getting all snow. No, I just saw his late afternoon update around 5pm. Still 1-3. Awesome job- Love the video! Posted updated forecast recap in new thread. How Cold Will She Go?